A large number of the billions of people who lack basic access to safe water and sanitation can count a mobile phone as one of their few possessions. Year after year, global and national institutions struggle to provide growing populations with basic water and sanitation needs, while mobile phones have become ubiquitous in the developing world. The spread of mobile phones has greatly reduced the time and cost of communication between multiple, often remote areas. Mobile phones are increasingly being used as cost-effective tools for collecting data and disseminating information. In the past decade, water and sanitation practitioners have begun deploying mobile phones as tools to improve water, sanitation, and hygiene (WASH) services. In studying the deployments of mobile phone for WASH, or mWASH, applications, this paper seeks to identify best practices and help inform future mWASH implementation for current and potential implementers of mobile phone solutions in the WASH sector. Hutchings, M., Dev, A., Palaniappan, M., Srinivasan, V., Ramanathan, N., Taylor, J. 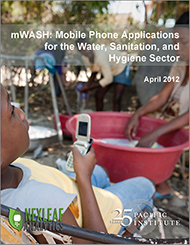 2012. mWASH: Mobile Phone Applications for the Water, Sanitation, and Hygiene Sector.